Roku offers a wide selection of news channels. 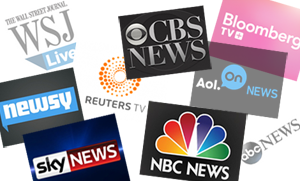 You'll find American broadcast and cable news networks, international newscasts, as well as channels dedicated to local, business, and politically-oriented news. Presented here is our selection of the best Roku news channels. CBS News - The CBS News Roku channel launches in full-screen mode with the feed from CBSN, a live 24/7 streaming video news channel with original reporting from CBS News. Press the "back" arrow on your remote to access the video on demand menu, which offers access to previously-aired CBSN segments as well as other content from CBS News. Additional news videos are offered by topic (including Politics, U.S., World, Entertainment, Health and Sci Tech, along with special topics of current interest) and you can watch segments from six CBS News shows: 60 Minutes, Sunday Morning, CBS Evening News, CBS This Morning, Face the Nation, and 48 Hours. Reuters TV - Reuters TV offers a variety of viewing options depending on your schedule and interest. News is curated based on how much time you have to watch (10, 15 or 30 minutes), or you can watch featured stories and previously-recorded live broadcasts. You can adjust your settings to focus stories on either U.S. or International news or US-based news. The news videos are constantly updated by more than 2,500 journalists in 200 locations around the world to keep you in touch with what is happening in the world today. NBC News - NBC News doesn't offer a live stream of their newscast, or complete episodes of any shows, but it does provide 30 categories of news clips and segments from popular shows. The channel launches as a live stream showing "Top Stories" from NBC and MSNBC. Press the "back" button on your remote to access the video on demand menu. Here you will find segments from shows like Morning Joe, The Rachel Maddow Show, and Hardball. Sky News - Sky News is a UK-based 24-hour news channel, and is unique in that its live stream is available on Roku. You can also watch on-demand video news clips under topics that include US News, World, UK News, Technology, Entertainment, and Royal Family. Newsy - Newsy takes a different approach to the news. Instead of doing their own reporting, Newsy covers each news item by using reports from several different news agencies. For example, a recent segment on a plane crash made use of reporting by NBC News, Associated Press, Rochester Democrat and Chronicle, AINonline and CNBC. Newsy offers videos under categories that include World, U.S., Politics, Business, Tech, Entertainment, Sports, and more. AOL On News - Available directly from your Roku home screen (look for the "News" option in the main menu), AOL On News offers hundreds of news videos in categories that include Top Stories, Entertainment, Movie & TV News, Best of Late Night, Animals, Tech, Sports and Finance. Videos are sourced from AOL On partners that include NBC News, Wall Street Journal, Inside Edition and Sports Illustrated. Unfortunately, the video are not dated or timestamped, so you won't know how "new" the news is. ABC News - ABC News provides both live streaming and on-demand news on Roku, with news highlights and multiple live streams. There are also clips from local news broadcasts in a limited number of markets and segments from some of your favorite ABC programs including Good Morning America, World News Tonight, Nightline, and 20/20. Wall Street Journal Live - The Wall Street Journal is usually associated with the business-oriented newspaper of the same name, but WSJ also has a worldwide network of reporters providing video coverage of the latest news around the world. The WSJ Live channel on Roku offers on-demand video news clips in categories that include Breaking News, Today in Tech, Offbeat & Absurd and Life & Culture. Also available are clips from the WSJ programs "Opinion Journal Live" and "WSJ Lunch Break." Bloomberg TV - If you're looking for financial and business news, Bloomberg TV provides a live feed of its 24-hour television channel, including all of your favorite shows like Charlie Rose, Game Changers, Street Smart, In the Loop, and many more. You will also find video on demand grouped under 21 shows and topics like Technology, Americas, Markets, Daybreak Europe and Businesweek. Sign into the channel using your Bloomberg TV app and you'll find your app playlist available on Roku. Noticeably absent from this list are Fox News and CNN. Fox News Channel on Roku carries the live audio broadcast from Fox News Radio along with video segments from recent episodes of popular FOX News shows, but you won't find the live cable feed or any news videos. We also left off Roku Newscaster, which used to be the premier news channel on Roku. This channel is no longer maintained - it still lists "ABC World News with Diane Sawyer" even though she has not anchored that broadcast since August 2014 - and only a few of the audio-only links still work. For local news, you may want to first search Roku channels for your local news affiliate (for best results, try your local station's call letters, such as WXIA or KSDK). A few of the local news channels on Roku carry live newscasts, but most offer only clips from recent broadcasts. If you don't find a dedicated channel for your local newscast, try NewsON, which carries live and on-demand news video from local TV stations around the country. The channel will automatically load a live stream the nearest station based on your Internet connection's IP address. Press the > button on your Roku remote to access video on demand or to change to a different station. Still not finding your local newscast? Try the Livestream Roku channel, which carries a vast array of live local newscasts. You can use the in-channel search function, or visit Livestream News Network in your web browser to search local stations. If you find your station there, you will still need to search for it in the Roku channel in order to view it, but the website makes the initial search easier. THOSE ARE OUR SUGGESTIONS for Roku news channels, but you'll find many more - including a number of politically-oriented channels - in the full list of Roku news channels. If you still can't find the news you're looking for, you might be interested in the private Nowhere TV channel, which offers access to a good number of news podcasts.